William John White Carson was the son of William McRobert Carson and Sarah Carson. William was born about 1887 in County Down, probably in the Belfast area. William was a student at the Royal School Dungannon between 1900 and 1902. William’s father was an Estate Agent on the Ormeau Road, Belfast. William enlisted with the 14th (Young Citizens) Battalion of the Royal Irish Fusiliers. The 14th Battalion were drawn from members of the Belfast Ulster Volunteers. By January 1915 William had been gazetted and was now 2nd Lieutenant Carson. 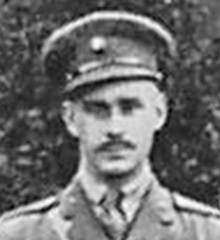 2nd Lieutenant Carson was killed in action on the first day of the Battle of the Somme on 1st July 1916. He was 29 years old.